Did you know that Google offers individual certifications for people who are a member of the Google Partners program? And we have now earned two significant Google certifications! 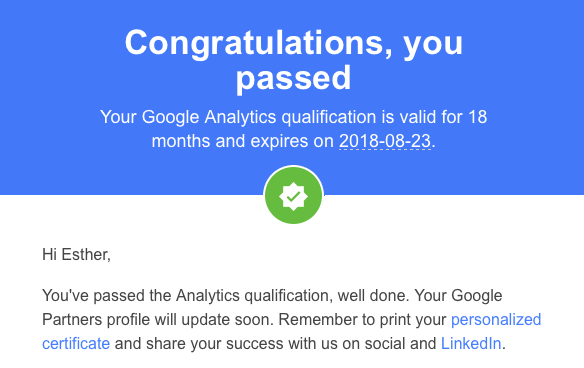 Our Digital Editor and Strategist, Esther Grace Ehrenman, is officially certified by Google to use Analytics and AdWords. Analytics and AdWords are industry standard methods of measuring web traffic and advertising campaigns. Why does Google certification matter? Here are a few reasons. Why use Analytics? Not only is it free, but it also provides powerful insights to track web and mobile app visits. You can segment audiences, filter out spam traffic, track engagement and site activity, and much more. How can these metrics be helpful for you? Perhaps you are receiving more visits from a certain county than another. You can use that information to expand your advertising or marketing into that region to reach people who are searching for services that you offer. You can also see which pages contribute to the most donations or purchases, and which pages are the least helpful. Google Analytics metrics help you make your website achieve your business goals and KPIs more effectively. AdWords offers the ability to create ads that display not only on search engines, but also on websites across the internet. It allows for creative control, flexible ad strategies, and improved demographic targeting. Analytics and AdWords are powerful, but not for the faint of heart or uninitiated. Taking advantage of their powerful creative and metric tools requires an intimate understanding of how the software works. Google programs also require knowledge of best practices on Search Engine Optimization, graphic design, copywriting, and much more. Not only do you need technical expertise to operate Google programs, but you also need to be well-versed in a variety of marketing platforms and best practices to maximize ROI. Google ads can reach more people more precisely. Instead of publishing and hoping that people read your content, you can pay to reach an audience who is interested and likely to buy. Analytics can then measure the behavior of people who click on ads and interact with a site. If you are interested in a consultation, feel free to contact us. We would be more than happy to offer Google Analytics and AdWords assistance!